Summer is 100% here now, but that doesn’t mean that I can’t still post something for Teacher Tuesday. I’ve officially survived my first school year at an international school, and I’ve made some wonderful memories with my first class. I wouldn’t change a single thing about the past 10 months, but there’s definitely some things I wasn’t really prepared for. I thought that after 4 years of teaching, I was ready for everything, and BOY, was I wrong. I wish I could go back to last August and tell past Angie to get ready for these 10 things. 1. You will pronounce at least one of your students’ names horrifyingly wrong. I still cringe when I remember the look on the parents’ face when I completely butchered an 8-letter name during the first week of school. I did my best but I was WAY off (and obviously embarrassed when corrected). I’ve learned that I should just relax and laugh at my terrible American pronunciation when it happens again (because it 100% will happen). 2. You need to be incredibly carefully about the words you say to parents and caretakers even if they are native English speakers. It’s quite amusing that certain words have specific connotations, and those connotations have been assigned to them based on where you’ve learned to speak English. I couldn’t for the life me understand why the British parents gave me a weird look when I told them that their son needed a belt for his pants. 3 hours later I was sitting on the couch when it hit me: OMG WHAT I MEANT WAS TROUSERS. 3. At least one parent will get annoyed (or angry) that you didn’t celebrate a national/religious/cultural holiday you’ve never even heard of. 4. There will be a parent that you will not be able to understand (no matter how hard you try). I’ve been working with children for 10 years. In that time, I’ve deciphered countless sentences and phrases from toddlers and preschoolers (Nurna? oh clearly he wants a banana…) , but for some reason, understanding an adult who’s not fully fluent is SO MUCH HARDER. I can only say ‘I’m sorry, what?’ so many times before it becomes pointless. That’s why email has become my best friend. 5. Bringing special treats for the class will be difficult because of all the different dietary restrictions. In addition to all the usual no-nos (I’m looking at you nuts and gluten), you’ll have students that come from cultural or religious backgrounds that have stricter diets. Thankfully, the parents are usually helpful to suggest alternatives. 6. Speaking of food, you will find yourself getting irrationally annoyed when your students take their awesome lunches for granted. 7. Your students will learn to speak English by mimicking yours. 8. They will also be quick to “correct” you if you they think you use an incorrect word. The most heated discussion we ever had as a class this year started when I told a student to throw their finished apple ‘in the trash’. Immediately, students started correcting me saying, ‘It’s the garbage’ or ‘No, it’s called the bin’. The students debated amongst themselves quite fervently, and they started getting more and more frustrated that we couldn’t agree on one term. Eventually, one student had enough and yelled ‘Everyone’s right ok!’…and that was the end of that. 9. 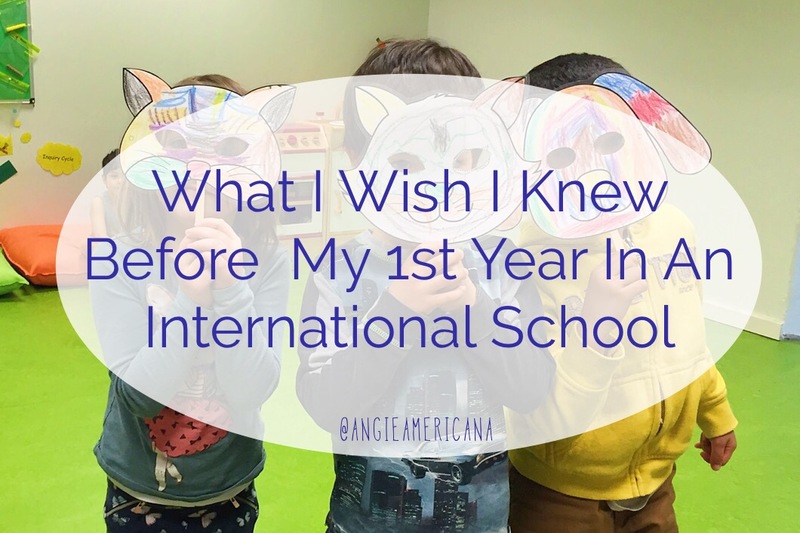 You’ll start to feel connected to countries just because you have a student from there. I’ve caught myself reading news stories about certain countries or getting heavily invested in a seemingly random soccer team just because that’s where one of my students is from. After spending most of my life only hearing or reading about my own country, it’s nice to take a real interest in others for a change. 10. You’ll realize that no matter how much mainstream media says hate is taking over the world, your classroom is proof that it is actually full of love. Every time I hear about a tragic event, hate-filled speech by Donald Trump, or senseless attack on innocent people, I lose a little bit more faith in the human race. But that all changes when I walk into my class. I see 16 children from various countries, religions, and backgrounds who come together every day to learn and play without giving a second thought to their differences. I wish the world could be a little bit more like my classroom. Past Angie definitely would have liked a heads up about all this…. I had a lot of fun coming up with this list because it gave me chance to really reflect on the wonderful school year I’ve been lucky enough to experience. I was blessed with an amazing class, and I’m so proud of everything we accomplished. Reading through all of these memories makes me really excited to start all over again August!